Guess most of us will be focusing on whether rains can make it into FNQ over coming days. Bold -- That would be a technicality...and one I'm prepared to overlook, despite living a world away in SA. It appears an eastern aspect of the sub-tropical ridge might be assisting said activity [from the Coral Sea] . The majority of Australia outside of rain forests and certain small climatic areas such as the sub-alpine areas of Tasmania burned at least once every couple of hundred years. As a natural system, the fire weather conditions and thunderstorms determine how often fires occur. In tropical savannah grasslands of the north it could be every 2-5 years, maybe every 5-10 in temperate grasslands (this ecosystem is for the most part now extinct due to grain farming), woodlands 20-50 years, forests 50-200 years depending on regions, this is a generalisation and I'm going from memory. The important difference was the mosaic pattern that was formed by random fire behavior, it broke up large chunks of forest or bushland into varying levels of succession, reducing the frequency of enormous fires that are so often seen since European settlement. Any long term un-burnt areas acted as biodiversity reservoirs allowing species to make their way back to areas which had had a bad run with frequent fire. Even rainforest will burn on very rare occasions, maybe every 500-1000 thousand years, who knows, provided the frequency of fires isn't too often for its natural regime pretty well any ecosystem will recover to its former glory given enough time. Fuel load does increase with the time since burning, not so much in leaf litter which increases in the years after the fire until it reaches an equilibrium as such eventually based on factors such as rainfall in the year previous which influences microbe numbers and fungal activity. The canopy fuel load however will go up and up until it chokes out the lower shrubs and the fuel load may decrease a little, but with increasing levels of larger branches on the ground floor which once again depending on the region can take decades to decompose. At this point the ecosystem contains less biodiversity than it had previously. In an unmodified ecosystem, only relatively small areas of the ecosystem will make it to this point and tend to be patchy. This is why the environmental department attempts to do interval burning as it helps maintain biodiversity. They tell the public it is for fuel reduction as lighting fires is viewed unfavorably by a large majority of the public. These days we have large areas of forest completely untouched and less biodiversity to utilise these resources it contains. We also have plenty of man created ignition sources. Meaning on extreme fire weather days where you wouldn't see lightning and therefore fires, we have firebugs strategically lighting fires into the densest of scrub, or branches dropping on powerlines, cigarette butts, hay bale spontaneous combustion etc etc...the end result speaks for itself. logansi has hit the nail on the head, we put out all the small fires on manageable days so when the really bad days come, we have huge fuel loads over vast areas and no hope in hell of stopping the fire. Also please, enough with bringing global warming/climate change discussion into this thread. It is a BANNED topic. The aboriginals used to use fire throughout Australia as a method of clearing thick scrub and even forest and by repeated low interval burning could convert it to fertile grasslands which supported larger populations of herbivores and made it easier to hunt. Should also add they could use this technique to encourage the growth of species useful to them. Some species will only exist for a few years after fire, seed, and then disappear for years or decades until the next fire occurs. They noticed this and burned accordingly depending on what species they wanted and/or where they were in Australia. Going by the Windy site, the EQ Pacific trades are set from a strong and prolonged blow from Nino.3 right through into even the edge of the western quadrant on Nino.4 next week. 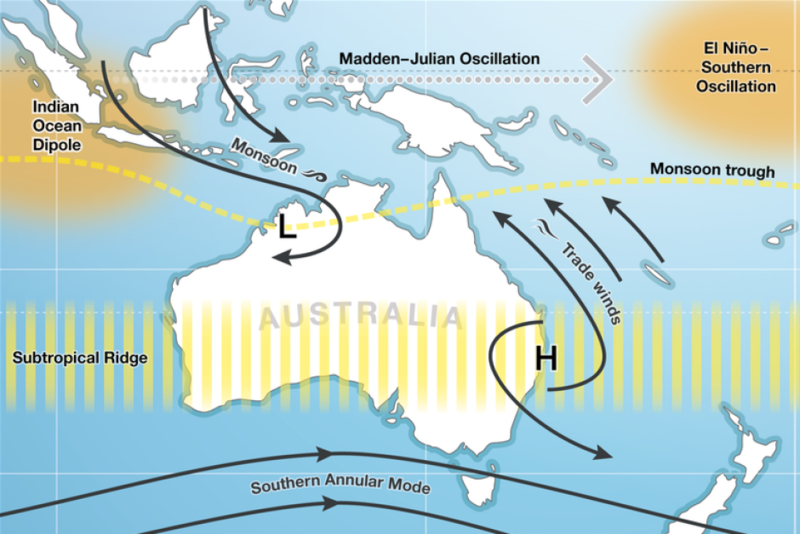 MJO now in the Indian, and on its way to Darwin going by model consensus. Pacific Ocean temps remain in the pattern as has been past 2 months, the waters in the Gulf of Carpentaria have joined Darwin to be equal hottest SST for Indian and Pacific ocean. Makes the Gulf a chance for a tropical storm imo over next week or two. ENSO is neutral, pressure over Darwin refusing to lift. All leads to a wet Christmas for vast areas of Aus?? Vigourous trades...setting up lower pressures over Darwin MJO behaving reasonably well, CHI200 still firmly planting La Nina signature, as it has been doing so for a while now, SST's more El Nino so they couldn't be more opposing if they tried atm. It's a fascinating battle. When I started the ‘Giant high pressure’ thread back at the start of winter I didn’t know as much about the IOD, but the conditions we saw through winter gave a pretty damn good example of how it works. Dr. Caroline led some of the lectures in my climatology class back in 2007/08, I gave a presentation about how the PDO is also a significant driver on a bigger time scale. We also did a project where we were asked to model global wind changes over the next 50-100 years based on NOAA and NASA data. Fun stuff, the team is pretty smart too, I definitely listen to whatever they have to say. I'm guessing Caroline spent a good part of the last decade researching the IOD/ENSO. While the Pacific SST grades warm to cool from Nino.4 through to Peru, I dont reckon it matters how "anomalously hot" it currently is. 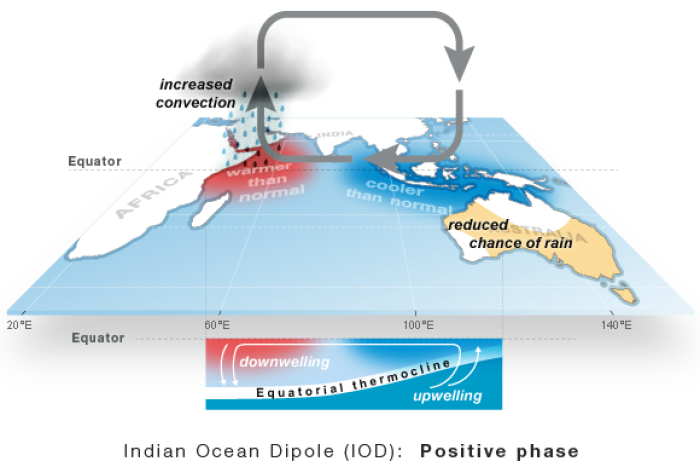 Its about oceanic RELATIVE temperature differences, over multi ocean broad scale, that matters imo. None of us have offered a credible reason for the SST/tropical convection/atmosphere "un-coupling" that we all have discussed here (with consensus), ...in my opinion, over past months. There is another factor(s), (or a weird combination of all the common indicators that we all follow) - I suspect its the sun solar variation/planet gravity mixtures - but admit I'm only guessing. One thing that does fascinate me, is that the Pacific Ocean is portrayed as being anomalously warm right now (against a 1981 - 2010 dataset), according to the measures available to folk like me. But I swear that I swam in 32C waters in the Pacific, at Fiji, this time of the year (presently circa 29C now), back in the early '80's, ...witnessed the thermo reading myself. Can someone tell me why the SST anomaly dataset isnt say, the average of 1940 - present (surface readings would definitely be available and accurate?)? Because, to me, our climatic predictions, for this day and age are simply not up to scratch. This thread is like the daytime soapy tv. Mike convinced an Elnino is around the corner, kino and others opposed to anything he says, and the odd interesting post. It’s about time people start paying much more attention to the Indian Ocean. I’ve been saying it for years. I'm not sure if the Indian Ocean has anything to do with the blocking quidge which caused those rainfall deficits either. It's one thing to have an active monsoon over the NW but it's another thing to get it to push eastward. Let me also add that it's nice to see an almost cloudless Indian Ocean on the satpic with all the action over QLD and in the Coral Sea for a change. Hopefully it stays that way for the most part and we get some good troughing through the eastern interior to drag some of that tropical moisture down through drought stricken QLD/NSW unlike the last couple of years. While I'm sure the Indian Ocean plays its part, there are other factors (some imo unknown) on the other side of the country that have prevented it from meaning much in the east. Never does east of the divide, Pacific derived moisture is far more important there. With the Great Divide, we should all state the regions in E Aus more specifically when we post here. What was the state of the IOD at the time, in the month preceding that pair of referenced events? 2016 was strongly negative before winding down at the end of the year. 2017 was moderately positive before winding down at the end of the year. Jamstec has achives of such data going back as far as the mid-00s. Just select parameter and year/month dropdown boxes. "As predicted earlier, El Niño/El Niño Modoki-like state has actually emerged in October. The SINTEX-F continues to predict a moderate-to-strong El Niño event that reaches its peak in late winter. 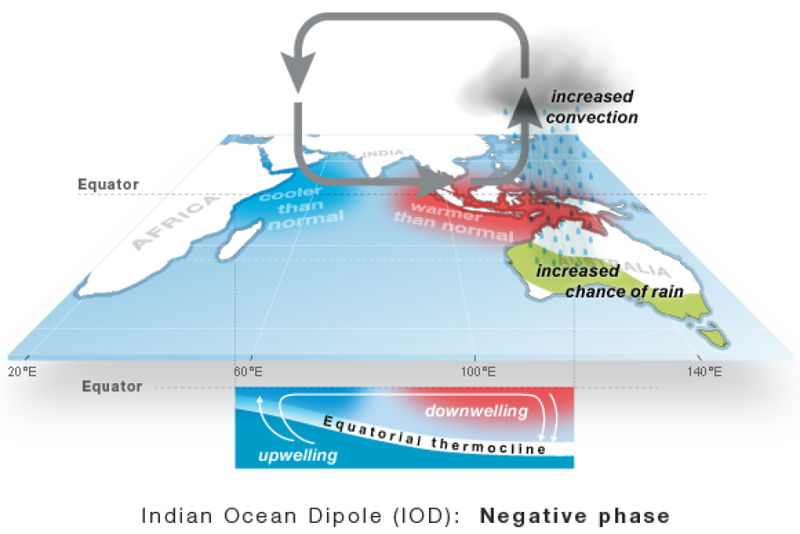 This El Niño is more or less of Modoki-type and we need to be careful of its impact as it may be different from that of the canonical El Niño." Though it should be noted that was last updated on Nov 1. Heaps of WV streaming into Aus over Geralton at the moment, MJO nearing phase 3 with a slight majority of models suggesting it will make it to Aus and decay here over next 10 days. Pacific ocean trades blowing keenly across all Pacific EQ regions bar doldrums in the southern sector of Nino.4. Surely the present climatic conditions around Aus will produce plenty of rain, over large yet varied areas, over the next 10 days. Had a look at that jamstec link Mega, if that prediction (acknowledging it is some 38 days stale) is to come true, there should be quite a rise in SST through Nino1.2-Nino.3, coupled with a fall Nth of New Guinea, ......commencing about now. That would take a big reduction in the trade winds in the East EQ Pacific, which is certainly not the case right now, nor predicted over coming 10 days by either EC of GFS acc. to the Windy site. It’s about time people start paying much more attention to the Indian Ocean. I’ve been saying it for years. There are probably numerous things we could pay more attention to (the IOD being one of them)...I guess it depends on what gets covered and how. 4 registered (Mike Hauber, bd bucketingdown, divho, samboz), 57 Guests and 4 Spiders online. Generated in 0.052 seconds in which 0.038 seconds were spent on a total of 14 queries. Zlib compression disabled.